The EPL All-Stars Masters defended their title this year, defeating the Liverpool Masters 7-4 in a pulsating final. Last year Liverpool Masters only managed to finish third but this year a strong team led by an in form Fowler bettered themselves by reaching the finals in 2012 losing out to one of the strongest teams we have seen yet on the EPL Masters Asia circuit. DPMM FC finished fourth in the tournament with Manchester United Masters coming up third. This year’s tournament featured a top notch list of names including legendary names from Liverpool FC and even a World Cup and Euro winner in the form of France’s Frank Leboeuf. The Guest of Honour, His Royal Highness Prince Hj Al-Muhtadee Billah, the Crown Prince and Senior Minister at the Prime Minister’s office, presented the medals and trophy to the winners. 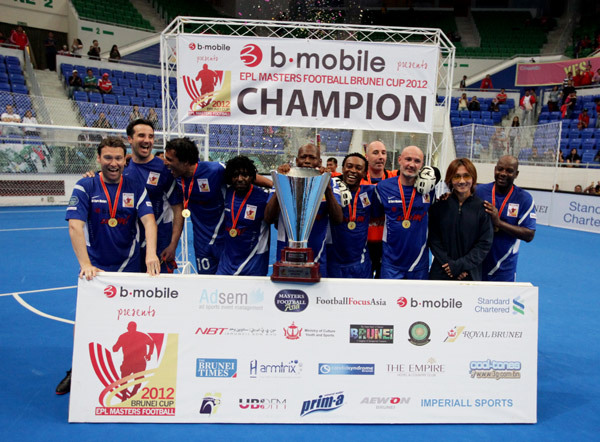 This is the second time that Brunei hosted the EPL All Stars Masters brought to you by B-Mobile. Kevin Gallen, Regi Blinker and Robbie Fowler were joint top scorers with 8 goals in the tournament. Regi Blinker was named the best player of the tournament. It was a night to remember for everyone at the Indoor Stadium of the Hassanal Bolkiah National Sports Complex, but for one particular fan Hadi, who had never won a lucky draw before, recieved the biggest prize at the EPL Masters Brunei Cup 2012 as he won a Lexus CT200H. The prize was presented to the awe struck Hadi by Robbie Fowler and Andy Cole, neither of whom went on to win any gold that day, unless you count Robbie’s joint Golden Boot prize.